This book sets out to present the Polish-Russian conflict the way the elite of Russian society saw it. One of its chief research topics is the interaction between Russian public opinion, the policy the Empire pursued on its uncompliant subjects, and the impact the Polish conflict had on the evolution of Russian political ideas and movements. 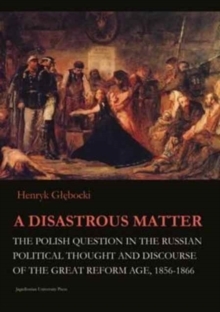 A major issue it addresses is the reaction of Russian society, its diverse political factions and social and philosophical trends and their relationship to the Polish national movement, and the effect of the Polish question on their evolution. Research in numerous archives and manuscript collections in Russia, Poland, Ukraine, Lithuania, played a fundamental role in the work for this book. This book was originally published in Polish as Fatalna sprawa: Kwestia polska w rosyjskiej mysli politycznej (Krak w: Arcana, 2000). It was awarded the Klio Prize, a prestigious Polish award for the best monograph on a historical subject. This English translation is an abridged version (about 1/3 of the book's original size).